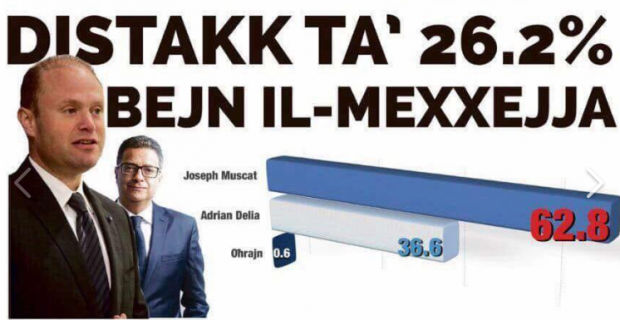 Prime Minister Joseph Muscat leads PN leader Adrian Delia by 26.2 per cent in a survey commissioned by the General Workers' Union weekly it-Torċa. The results were announced today, a year after the Labour Party was re-elected for a second term. Dr Delia was not PN leader at the last election. The newspaper says 62.8 per cent of respondents said they backed Joseph Muscat, compared to 36.6 per cent who backed the PN leader. The Labour Party leads the PN by 17.8 per cent, equivalent to an advantage of 55,000 votes. The survey was conducted by Vincent Marmara'. At the general election, the Labour Party won 54.83% while the Forza Nazzjonali alliance led by the PN won 43.34%.